STOCKTON - Turlock's Wes Miller could feel time was running out with his engine overheating with 10 laps still to go. But Miller, last season's Grand American Modified champion, guided his car across the finish line to win the second 40-lap twin ahead of Tracy's Scott Wintersin front of an estimated 2,000 fans at Stockton 99 Speedway. Winters won the first GAm main event of the evening. "I knew we didn't need to be racing side by side with (Winters) like we did in the first race," said Miller, who climbed into second in the season points standings with the victory and his second place finish in the first main. "We were lucky we didn't tear up our cars in the first race, but my car was overheating with 10 laps to go. We were very fortunate because I was down 100 horsepower and ran at half throttle at the end." Winters earned his win under a checkered yellow flag ahead of Miller and Menlo Park's Nick Romano respectively. Winters took the lead on a red flag restart on lap seven and Miller climbed into second one lap later and the two fought each other to the end, which was ended on lap 36 due to three yellows in the final six laps. "(Miller) was tough on those late restarts," said Winters, who took sole possession of the points lead from Ripon's Mike Regelman, who didn't race Saturday due to engine trouble. "It was door to door (racing) for a while. It's a real good battle between us. We just ran out of laps trying to catch him in the second race." Santa Rosa's Andy Vanderveer of Santa Rosa won the Modifieds dash, but a blown engine ended his night on lap six of the main. Manteca's Joseph Reichmuth extended his points lead in the Basic 4's class by grabbing the checkered flag in the 30-lap main over Rocklin's Dave Kong and Manteca's Matt Anderson respectively. Reichmuth's victory in the heat race padded his points lead over Kong, while Anderson earned the trophy dash win. Zane Smith of Huntington Beach took the 20-lap semi main event in the Legends of the Pacific after passing Stockton's Keith Clement on lap nine, finishing almost a straightaway ahead of Ricky Schlick of Pomona, Parker Malone of Redland and Cody Berger of Tracy. Tracy's Jeremy Wood took the A Main checkered flag after starting midway back in the 24-car field. Wood passed Laguna Beach's Ryan Cansdale on lap 20 then held off Santee's Darren Amidon for the win. Brent Scheidemantle, 19, of Alta Loma, edged Lincoln's Danny Allen, 12, for the dash victory. 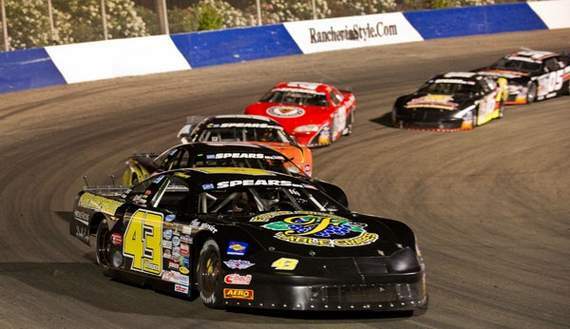 Derek Thorn of Bakersfield won the Supermodified Racing League's Southwest Tour series race, the Strandwold Properties 125. No further details were not available at press time. The Speedway hosts Whelen Night next Saturday featuring both Late Model and Modifieds twins, Super Stocks, Pure Stocks and Basic 4's.